Adding the life spans of the rulers doesn't provide a "biblical" answer to the age of the earth because the Septuagint, the Masoretic, and the Samaritan texts don't agree on the number of years. The total number of years in the Septuagint and the Masoretic (Hebrew) records agree except in the case of Lamech the Younger (Noah's father). The Septuagint assigns Lamech a total of 753 years, whereas the Samaritan Pentateuch assigns him only 653 years. The Masoretic text assigns Lamech 777 years. Lamech the Elder, the father of Tubal-Kain, isn't assigned an age span. It is evident that the age of the earth can't be calculated using the lifespans of the rulers listed in Genesis. or the son of man (ben adam) that you care for him? Here we see that the historical first ancestor Enoch is paralled with the first man Adam. The author of the Psalm makes a distinction between the two figures, but also regards them as real fathers of the people. They are the deified rulers who are ancestral to Jesus Christ, the Divine "Son of Man." Bishop Usher’s dating is not accurate because he didn’t recognize the telescopic nature of some genealogical lists. He believed that all the genealogical lists involved biological fathers and sons, but some of the lists are telescopic, listing only the most famous of the chiefs. This means that we can’t use the genealogies to measure years. All the genealogical lists are telescopic except for Genesis 4, 5 and Genesis 11:24-26. Usher also didn’t understand that the genealogical material in Genesis 4 and 5 pertains to the wives of Cain and Seth, the daughter of an African chief named Enoch or Nok. Therefore the name that should appear at the head of the family tree is Nok, the father-in-law of Cain and Seth. Analysis of the Genesis 4 and 5 kinship pattern makes it clear that Adam is not the head of these lines. In biblical parlance Adam represents the first created man. Since the oldest human fossils are over 3 million years old, Adam would have been created at least before these humans. Enoch, on the other hand lived no more than 12,000 years ago. He is the father-in-law of Cain and Seth. Cain and Seth's brides named their first-born sons Enoch, after their father. This name is sometimes rendered Hanoch, as in the case of Reuben's first-born son. 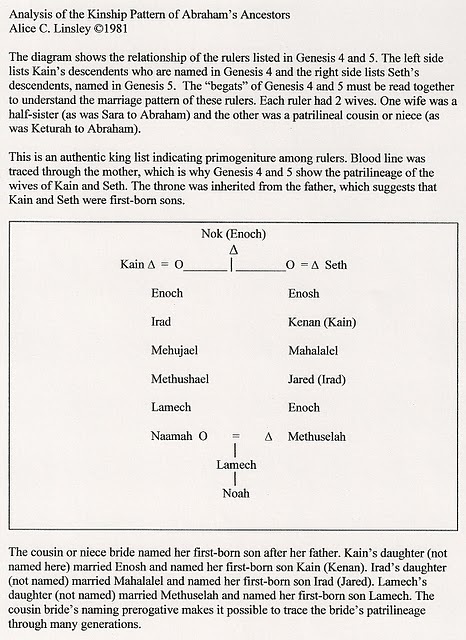 The name that should appear at the head of the Genesis 4 and 5 family tree is Enoch or Nok. Bishop Usher appears to have been unaware that the descendents listed in Genesis 4 and 5 were ruler-priests whose lines exclusively intermarried. Each ruler-priest had 2 wives. One was a patrilineal cousin or niece who named her first-born son after her father. This explains the recurrence of names in chapters 4 and 5. For example, Kain and Kenan and Irad and Jared are linguistically equivalent names. In the case of Lamech's daughter, Naamah, the pattern is quite clear. She married her cousin Methuselah and named her first-born son Lamech after her father. Knowing the marriage pattern of the Horite ruler-priests helps us to trace Jesus Christ's ancestors from Genesis 4 and 5 to Joseph and Mary, of the ruler-priest lines, whose marriage appears to have been consistent with this pattern. It is not clear how you are inserting this Enoch reference. Patrick Reardon in his Christ in Psalms indicates a reference to Jesus. Adam and Eve are etymological, not proper names. Both are traceable to western Afro-Asiatic roots. For example, "dam" in the Chadic and Kushitic languages means red and refers to the earth which the ancient Kushites believed was the source of blood. I'm not inserting Enoch. This is a direct translation from the Hebrew text which poses Adam and Enoch as parallels. I've no argument with Fr. Reardon's view. Everything in the Bible is ultimately about Jesus Christ, the Son of God, in fulfillment of the Bible's first promise (the Edenic Promise) in Gen. 3:15. Oh, hello. Learned about this blog through your interview in Road to Emmaus. Welcome to Just Genesis, Dan. Kain's first-born son was named Enoch and Seth's first-born son was named Enosh. These are linguistically equivalent names. The name appears later in Numbers as Hanoch, the first-born son of Reuben. "Hanoch" and "Enoch" are spelled exactly the same in Hebrew, the only difference being vocalization of the vowels. Therefore, observing that "Enoch" appears in Numbers as "Hanoch" is exactly like saying that "Laurie" (pronounced "low-ri") appears later as "Laurie" (pronounced "law-ri"). "Enosh" is an altogether different matter. I would like to know the basis of your claim that it is "linguistically equivalent" to "Enoch." I don't think any semiticist would agree with you. "Enosh" is a straightforward use of the unambiguous root aleph-nun-shin, which means "man" in several semitic languages. "Enoch" is from the root heth-nun-kaph and probably means either "dedicated one, initiate" or "follower." That root shares only a single letter with "enosh," and while it's possible that the two gutterals aleph and heth could conceivably swap (although unlikely), it's far-fetched to claim that a shin and a kaph would ever do so. That's like saying an "s" became a "k" as a word moved from one European language to another. In short, I think you need some very strong, hard evidence in order to claim that Enoch = Enosh, however similar they look once Anglicized. Hebrew is a relatively recent language, do you agree? It is preceeded by Old Arabic and the roots of the Dedanites are Ham and Kush. So we much look to the Nile region for the meaning of the words that apply to these ruler-priests. "Nakht" means powerful in Egyptian and applied to rulers, as in Pepi-nakht-Heqaib. In Hebrew it takes the form ha-nok, which means the chief. The name probably is connected to the Nok civilization in west central Africa which predates the Chaldeans by at least 4000 years. True, Hebrew is relatively recent and localized compared with other semitic languages, but there is no mystery about its predecessors: Aramaic and Phoenician, which are ancient indeed. The root for the name "Enoch" (heth-nun-kaph) appears in Hebrew, Aramaic, Syriac, Arabic, and Ethiopic, so it's not as if there isn't any evidence available as to its basic meaning, which is something like "to use for the first time," a meaning which accounts for all of its forms and derivations in all of those languages. It's not certain if that circle expands all the way to Egypt, but if it does, shouldn't you give first consideration to Egyptian roots that retain the heth, like all the other languages do? Some people think Egyptian hnk.t "tribute, offering" is related, and some don't. To lop off the heth and pull out "nakht" as the ultimate source is going to require some hard evidence before any reputable linguist will buy it. As you point out earlier, Enoch and Enosh are Anglicized. In fact, they made their way into modern versions of the English Bible from the Old English Bibles. It is understood in comparative linguistics that the phonemes ch and sh are often interchangeable (as with the Old French use of ch for the English sh), and that they are sometimes reduced to the phoneme K (as the Old English C almost universally is spelled with a K in the German). As the names Enoch and Enosh are translations from Old English, it can be argued that Enoch (Kain's first-born son, listed in Gen. 4) and Enosh (Seth's first-born son, listed in Gen. 5) are equivalent and can be rendered Nok. Nok is probably a throne name as it appears in the royal names such as Tef-Nakht and Pepi-Nakht-Heqaib. Nakht applied only to rulers and in Hebrew takes the form ha-nok, which means the chief. Hanock is the name given to the first-born son of Jacob's first-born son, so the name pertains to the ruler-designate. These are the first-born sons by two wives. The first-born son of the sister bride ruled in place of his father and the first-born son of the patrilineal cousin or niece ruled in place of his maternal grandfather. I really appreciate your excellent observations. We don't agree, obviously, on whether Enoch and Enosh are linguistically equivalent, but that's okay! I've really enjoyed the conversation. Would you mind if I made this discussion available to other readers of Just Genesis? No, I don't mind at all, and thank you for the kind words. I would point out that the Hebrew kaph does not represent the phoneme ch. It's not a gutteral; it's a good, dry, hard k. It's the heth that = ch. (I wish I could put a dot under the "h", but I can use a "ch" instead, as the heth is pronounced much like the German ch.) Also, "ha-" meaning "the" uses the he, not the heth. If I'm following you correctly, you're arguing that at the front of the original word ("nok"), a he was added ("ha-nok," i.e., "the nok"), so presumably we've already taken "nok" into Hebrew at that point, since we're putting a Hebrew "the" on it. The he then turned into a heth (for the name Enoch) and it also turned into an aleph (for Enosh). Meanwhile, at the back end of the word "nok", the Hebrew quite predictably used a kaph (first on "ha-nok", and then "cha-nok" or Enoch), but at some point this kaph turned into a shin, presumably at the same time that the letter in front (either a he or a heth) was turning into an aleph, and that's how we got enosh. But for your "k" to morph into a "sh" I would think you would need an intermediate step, like the "k" becoming a "ch" and then a "sh," unless you have something in comparative linguistics suggesting that a k can turn directly into a sh. Any one of these phonemic shifts by itself is possible, and some of them are unremarkable, but taken as a whole, doesn't the bumpy pathway you've traced out whereby the names Enoch and Enosh may equal each other, and both of them may equal Egyptian Nok, require an awful lot of special pleading in the absence of hard evidence? Especially since "chanok" and "enosh" are easily derived just as they are from the pool of common semitic roots right there in the Hebrews' back yard? Nok probably was not Egyptian, but his line intermarried with the Nubian line that conquered Egypt. I agree that the etymology of the names has been solidified by the Hebrew text, but Abraham's ancestors lived before Hebrew developed as a distinct language. Of course, this raises the really big question: What language did Abraham's ancestors speak? I'll post our discussion tomorrow or the next day. Thanks again for engaging me on this. You've given me more to think about and research.